Helps prevent and relieve chafed, chapped, or cracked skin. 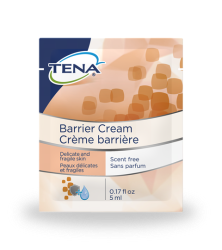 This gentle formula is designed specifically for use on elderly skin during incontinence care routines. It contains the active ingredient dimethicone and a blend of natural oils*, glycerin, and vitamin E* that absorbs into the skin and protects it from irritation caused by contact with urine and/or stool. Absorbs into the skin and protects it from irritation caused by contact with urine and/or stool. Contact TENA for your own personalized consultation, and to learn more about our products and solutions.